I just wanted to say well done on doing this. It would be great if you could publish the data tables for polling enthusiasts to digest. 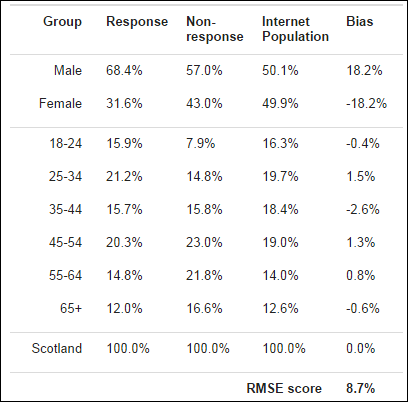 – do web users not tend to be more politically engaged and therefore more inclined to vote Yes ? – do polls take into account the differential in turnouts for Yes and No ? Thank you very much for your answer. PIerre-Alain. I’m a student in Scotland and I was actually at a debate with my school and they made us vote at the start and it was around 80 percent to the no vote and 20 percent to the yes vote, why? Because they weren’t informed, they used very descriptive language and I don’t think people understood so much so the percentages only differed to about 70% to no and 30% to yes, but it’s clear for that example, ill-informed people are willing to go for no for the security of not losing ties to the UK. Besides being cheering news for those of us who favour Yes, it is wonderful to see people outside the mainstream mass media doing their own research. This should be made available to as many people as read/heard about the poll yesterday, showing No in the clear lead….Maith thú – well done! This is what I call public service internet work. Very interesting. I am biased in favour of Yes, I have to say before I start. I wonder how you could introduce the stanard deviations of the results so as to provide some sort of confidence intervals. With sample sizes of 1000 the two standard deviations are about 63 (1000^0.5 * 2), which in my rough and ready calculations works out at about 6%. So the 95% confidence interval is around +or- 6%.. My knowledge of this is a bit rusty but I do know that it is important to include confidence intervals. This is very seldom done but I am sure the researchers calculate these even though they are not published. Without them, it is impossible to say if there is any significant difference between the Yes & No counts. Of course, the undecided should be included in the calculations but this is more difficult, as should the weighting which you have introduced. On the basis of the above, I think most of the polls quoted recently show no statistically significant difference between the Yes & No. How much would the difference have to be in your sample of 1000 with your calculations to be significant? It seems that is is all up to how we vote on the day, with the undecideds vote being really important. Thanks for taking the time do produce this! I would know what your thoughts are regarding the question from Pierre-Alain Coffinier, I imagine that if this were the case, the Yes result would be far greater! Postal Code Data Now in Google Analytics What Would Happen if you Flipped the Scotland #indyref Question?